BBC1. 6 episodes: 4 May-8 June 1974. 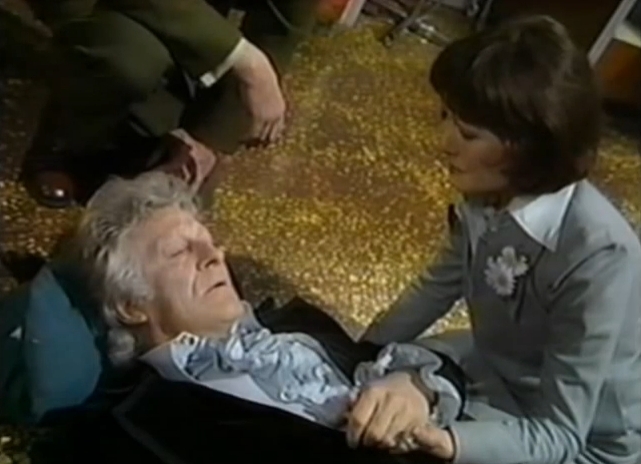 Starring Jon Pertwee as ‘Dr Who’ and Elisabeth Sladen as Sarah-Jane Smith. Produced and directed by Barry Letts. I have the impression that the reputation of Jon Pertwee’s ‘era’ as the Third Doctor has suffered somewhat in recent years: few of his stories tend to feature among polls of fans’ favourites. For some critics the Third Doctor’s period was too Earthbound: for the first time in the series’ history a particular story template (the alien invasion narrative) became dominant and other story possibilities were cut off. For others the Third Doctor was too much of an ‘establishment’ character: now working as scientific adviser to UNIT (United Nations Intelligence Taskforce) he was associated with the military-industrial complex as a sort of Quatermass character. I’d argue that neither of these criticisms really stand up to scrutiny. The alien invasion narratives predominated early in Pertwee’s period during Series 7 and 8 but were less common once the Doctor had regained the ability to pilot his TARDIS (he had been ‘exiled’ on Earth by the Time Lords at the end of his second incarnation). And the Doctor’s relationship with UNIT and the military-industrial complex was not always an easy one. In Series 7, especially, his relationship with Brigadier Lethbridge-Stewart of UNIT is quite edgy, while a recurring theme of the Pertwee stories is that authority figures, especially government ministers and senior civil servants, are not to be trusted. Jon Pertwee was my Doctor: the first I saw and therefore the one who introduced me to the marvellous world of Doctor Who. Although it’s probably not a vintage season, I’ve always had fond memories of Series 11 in 1973-74 as it’s the first of which I have a clear memory. (I vaguely recall some images from ‘Planet of the Daleks’ but I’m sure I did not see ‘The Green Death’ at the time of its original broadcast: perhaps I’d been too frightened by the Dalek story.) This series brought us the first appearance of the Sontarans (‘The Time Warrior’), a regulation Dalek story (‘Death to the Daleks’), puppet dinosaurs on the rampage in London (‘Invasion of the Dinosaurs’) and a sequel to a previous Pertwee story with returning villains in the Ice Warriors (‘The Monster of Peladon’). ‘Planet of the Spiders’ had originally been intended as the final confrontation between the Doctor and his new recurring antagonist the Master, a renegade Time Lord – a sort of Moriarty figure to the Doctor’s Sherlock Holmes – but sadly actor Roger Delgado’s death meant that was not possible. Instead producer Barry Letts and writer Robert Sloman devised a suitable farewell story for Pertwee that indulged his fascination with gadgets and speed – exemplified by the extended chase sequence in Episode 2 – while at the same time providing a more psychologically complex story than usual with strong metaphysical overtones. ‘Planet of the Spiders’ exploits a relatively common fear (arachnophobia) and magnifies it – literally – through the Giant Spiders of Metebelis Three. 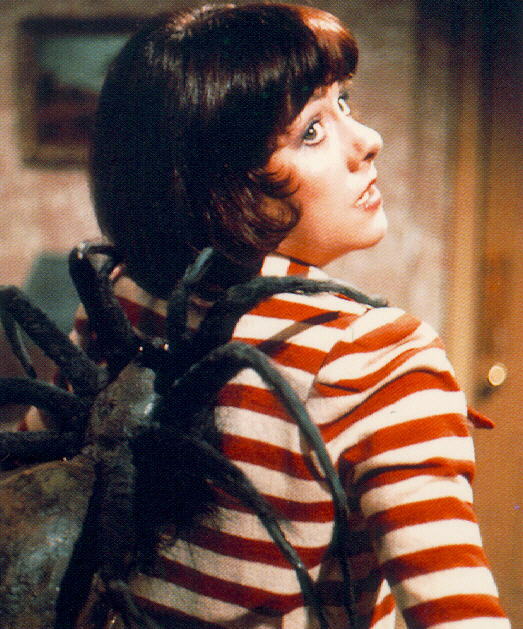 The BBC’s Audience Research Department found that viewers thought ‘the giant spiders in this story (perhaps mercifully) less life-like than some monsters the series had created’. To one viewer of five and three quarters I can testify that they were quite frightening enough! Unlike a Dalek or an Ice Warrior or even a Tyrannasaurus Rex, a big spider was something that you might just meet. I even remember being frightened by the picture of the spider on Sarah-Jane’s back that adorned the cover of the Target novelisation of this story – the first Doctor Who novel I read – though not so frightened that I did not want to read it. I’ve mentioned this before but before the advent of home video the Target novelisations were the only way of revisiting Doctor Who stories. I was an avid reader of them between the ages of about seven and twelve. Looking at the story again after its release on VHS in the 1990s (except for ‘Genesis of the Daleks’ there were very few repeats of classic Doctor Who stories) I could better appreciated the thematic complexity of ‘Planet of the Spiders’. It can be understood as a metaphorical narrative informed by popular psychiatry in which the spiders represent the inner demons of the mind. As Sarah-Jane remarks at one point: “If you do start ferreting about in your subconscious, aren’t you going to turn up all sorts of nasties? I mean complexes, phobias and what have-you.” Monsters of the Id, in other words. The spiders also represent the Doctor’s own fears. As the wise Abbot K’anpo – who turns out to be another Earth-dwelling Time Lord and the Doctor’s old tutor – tells him: “Not all spiders sit on the back … What is it you most fear?” The Doctor has to face up to the consequences of his own ‘greed for knowledge’ and must confront his fear by entering the cave of the ‘Great One’ – an enormous mutated spider – knowing that the radiation there will be too intense for his body to withstand. This is what will trigger his regeneration at the end of the serial. Although intended as a swansong for Pertwee, ‘Planet of the Spiders’ now seems to anticipate later developments in classic Doctor Who. We start to see the emergence of continuity references which hitherto had not featured very prominently in the series. Hence the narrative is set in motion when the Doctor’s former companion Jo Grant returns to him the fabled blue crystal of Metebelis Three. A recurring joke of the later Pertwee stories was that he was always trying to visit this fabled ‘blue planet’ – it’s the sort of ‘hook’ that Russell T. Davies and Steven Moffat have since employed extensively in signalling future narrative developments in the new series. It turns out that the crystal belongs to the Giant Spiders, who want it back to complete their circle of power. A psychic link has been established between Metebelis Three and a meditation centre where a group of residents seeking spiritual enlightenment have fallen under the influence of the megalomaniac Lupton (the finest hour of character actor John Dearth). It turns out that one of the residents is Mike Yates, who has gone there to “sort myself out after that Golden Age business”. This was a reference back to ‘Invasion of the Dinosaurs’ where UNIT’s Captain Yates had become involved in ‘Operation Golden Age’ – an attempt to turn back time, hatched by a group of misguided idealists. Again the suggestion that regular supporting characters had a life of their own has become a major feature of the new series – but it was pretty much unknown in classic Doctor Who. Two other aspects of this series stand out for me. Some may dislike the extended chase sequence in Episode 2 for padding out the story. Yes, it is narratively irrelevant: Lupton, who has stolen the blue crystal, eventually escapes his pursuers. But not only is it a lot of fun (witness the comedy policeman who tries to arrest the Brigadier for speeding), it also exemplifies the trend towards action and spectacle that was a characteristic of the Pertwee ‘era’ of Doctor Who. In a sense this is the closest that Doctor Who ever came to the James Bond films, with a chase involving the Doctor’s vintage Edwardian roadster ‘Bessie’, the futuristic ‘Whomobile’, an autogiro, a speedboat and a hovercraft. The car chases in early 1970s Bond movies such as Diamonds Are Forever and The Man with the Golden Gun were often narratively irrelevant too but they were an essential part of the spectacle. Under Barry Letts, Doctor Who had ventured much more frequently outside the studio than in the 1960s: the chase sequence here is in a sense the culmination of that tendency. And it still stands up pretty well today. ‘Planet of the Spiders’ was written by Robert Sloman, whom I regard as one of the under-appreciated writers of classic Doctor Who. Sloman also wrote ‘The Dæmons’ (in collaboration with Barry Letts under the pseudonym Guy Leopold), ‘The Time Monster’ and ‘The Green Death’. 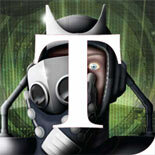 Granted, ‘The Time Monster’ is no classic, but the other two adventures also have good claims to top ten status. Indeed I’d go as far as suggesting that Sloman was as good a writer as Robert Holmes and probably made just as important a contribution to the internal history of Doctor Who. I don’t know why he wrote no more stories following ‘Planet of the Spiders’ – perhaps someone out there can enlighten me? This entry was posted on November 21, 2014 by Who Watching in Classic Doctor Who and tagged Barry Letts, Doctor Who, Elisabeth Sladen, Jon Pertwee, Robert Sloman, Top Ten.